Sagittarius is all about exploration, utilizing key traits of strength, independence and optimism as tools to forge ahead. The Sagittarian full moon is an opportunity to explore, be it the world around us or our inner selves. A fire sign, Sagittarius is optimistic, adventurous and passionate. A full moon in this sign brings all of those traits to the table. Exploration is the key theme with Sagittarius. Through the journey we choose to take, we learn patience, gain wisdom and hopefully achieve success. However, because we are wide-eyed and optimistic, we need protection. My altar for Sagittarius focuses on a key element of protection while emphasizing all of the traits the sign has to offer. Front and center is the stag, a protective yet adventurous figure. Linked to Sagittarius by the sign's centaur body and hunting equipment, the stag gives us nurturing stability at a time where we may need it most. It protects us as we explore some of the darkest parts of ourselves. The stag serves as a holder for a blue and purple pillar candle. These colors are commonly associated with Saggitarius - blue pointing to the sign's positive attitude and purple towards the independence and wisdom it can offer. 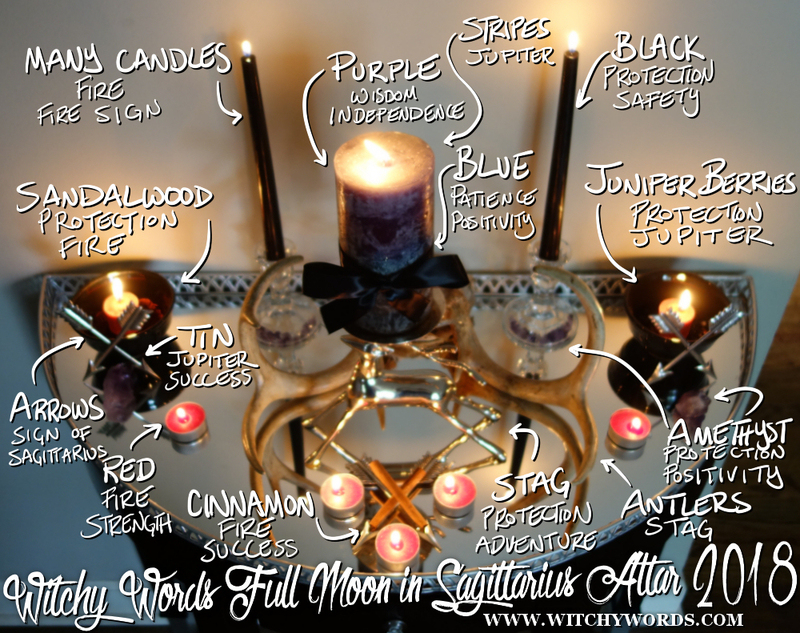 A black bow tied around this candle represents the grounded protection needed during this full moon. Surrounding the stag candle holder is this beautiful rack of antlers. This further emphasizes the stag motif and gives the altar a natural element. In front of the stag sits a tin cross of arrows with cinnamon placed on top. The X this design makes emphasizes the protective properties of the cinnamon. Surrounding that are three red tealights. These candles link the altar to the fire element of the sign, both literally and metaphorically. On either side of the stag are two offering bowls. Each bowl has a set of crossed arrows standing in front of them. These arrow symbols are made of tin, a metal associated with Sagittarius's ruling planet Jupiter. Additionally, it creates the perfect visual with the candles behind them as the flame dances between the arrows' ends. Also in front of each offering bowl is a chunk of amethyst. Amethyst is a stone of happiness and protection, emphasizing the positivity of Sagittarius and the need for protection during this time. Inside the offering bowls, we find juniper berries and sandalwood. Sandalwood, red in color, is linked to fire and often used for protection. Likewise, so are juniper berries. The latter is also linked to Sagittarius's ruling planet as well. Because this altar is for a fire sign, it's loaded with candles, from the large pillar candle in the middle to the multiple small red tealights to the large black tapers. The altar is quite literally ablaze. The final subtle detail of this altar is the amethyst shards under the tapers. Encased by the glass of the candle holder's base, the shards are organized in a crescent moon shape, linking the altar directly to the moon itself. Overall, this altar serves as a beckoning of protection during a potentially naive and wreckless time. Exploration is so necessary to the Craft, but caution must always be used. Sagittarius lacks that necessary trait, so this altar invokes it. I'll leave you with a visual explanation. Enjoy! I love how thorough and thought out this altar is. It is beautiful and I can just imagine the strength and safety you felt while in it's presence. Thank you for sharing, it is very inspiring. Thank you so much, Anon! I'm so glad you enjoyed it!